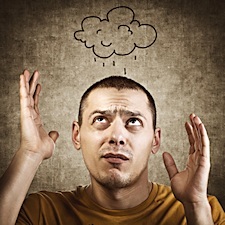 How has the cloud materialized for CAD users and managers? It's been about five years since we started being bombarded with "CAD on the cloud" messaging from CAD software developers and vendors, so it's a good time to review what we've been promised and evaluate how the reality is working out for CAD managers, users, and companies. To frame the discussion, I'll present some topics that I've found key for many of my clients, cover some questions I get from senior management, and explain my conclusions along the way. The cloud remains a nebulous concept, but breaking it down into its components will make its impact on your CAD management plans much more obvious, so we'll start by doing just that. Here goes. Private clouds. Increasingly, companies are creating their own private clouds in centralized data centers to service their own users across their own virtual private networks (VPNs). Private clouds can serve branch offices or mobile workers alike without the security risk of using an outside provider. Over the past few years I've maintained a Facebook group that has become an increasingly robust resource for all of us. I encourage you to join up and participate in a great group of talented individuals. 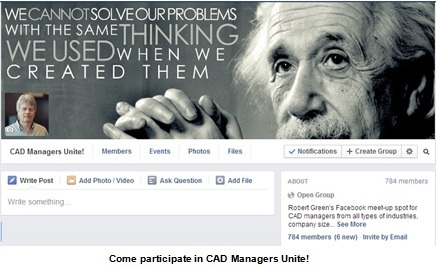 Log into your Facebook account and search for "CAD Managers Unite!" Click the "Join Group" button to be added to the group. Once your membership is added, you can post/answer questions, start conversations, share resources, and interact with the group (about 800 corporate CAD managers at present). Though any topic is fair game, the group tends to focus on solving tricky hardware and software configuration issues, management interaction, and training issues. In short, the group is place where CAD managers can ask targeted questions and take advantage of the unique expertise that only other CAD managers have in a relaxed social environment. Over the next few weeks I'll be collecting CAD manager feedback on cloud-based CAD via some open requests for comments and survey posts. Why not make your opinions known? Do you have a question or tip for the CAD Manager's Newsletter? Send it to me at rgreen@cad-manager.com. If I use your tip in the newsletter you'll receive a cool Cadalyst prize! ZW3D, a supplier of CAD/CAM solutions for the manufacturing industry, has launched a ZW3D CAD/CAM online user community. The community comprises a discussion area, a learning center, a download area for updating software, and a library for sharing commonly reused CAD data. Members can share concerns, ideas, and data with other professionals worldwide.